Hello there, as you are here than I can easily guess that you are an angler and you love to fish. So want to catch a salmon? It is not so tough but it is quite tricky. Because this fish is fast and powerful fish to catch. Then why to take the hassle to catch salmon fish? Well, the salmon fish is one of the most delicious and nutritious food that can a fish provide. It contains all kinds of vitamin, a mineral you can name of. So if you ask me how to catch salmon fish my answer will be – you have to be patient, have the perfect fishing equipment and lots of knowledge about this salmon fish. All the best. Why is salmon fish popular? Why not everybody likes salmon? The term "salmon" comes from the Latin word salmo, which in turn might have originated from salire, meaning "to leap". Salmon fishes family is Salmonidae. Typically, salmon are anadromous in nature. This type of fishes has very interesting life style. They born in fresh water, migrate to the ocean, and then come back to fresh water for reproduction. 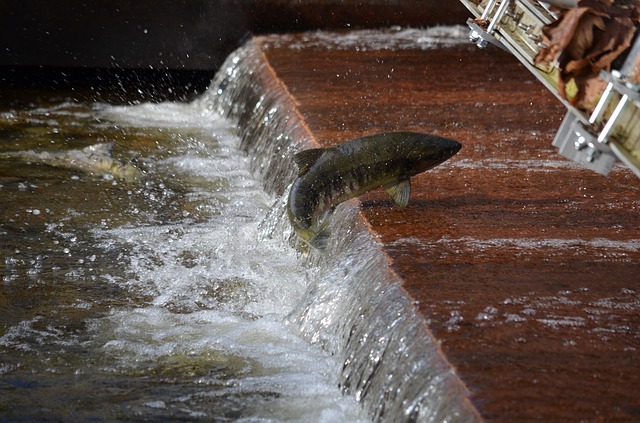 Salmon fish exactly return to the spot where they born in freshwater; this is proven by studying tracking system. Salmon is an integral of an aqua cultural industry for farm growing fin fish. Usually salmon is a most consumed common fish in the world. 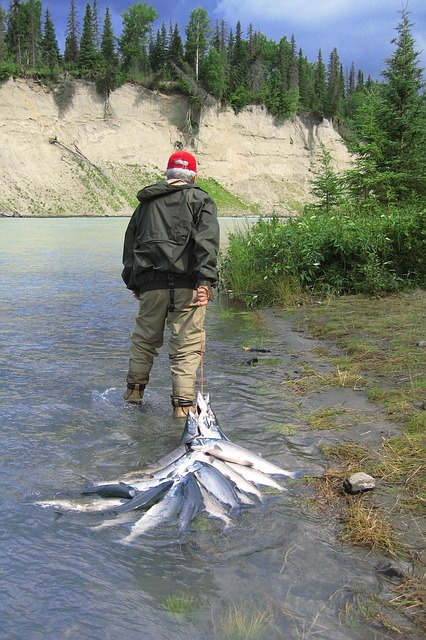 By reading, this article your knowledge will enrich for catching of salmon fish. There are a lot of tips, techniques for catching the salmon fish efficiently. Here I am highlighting the tips of salmon fish catching with success. Selecting hooks: To catch salmon fish, it is very important to select the perfect hook for the salmon fish. Sharp hooks: Because of a thick jaw of salmon fish, hooks should be sharp like a razor. I recommend here, Lazor sharp brand. Bait of salmon: One of the best effective bait is live bait for catching salmon fish. It should be collect from your own eggs. You can purchase artificial eggs like Mepps Aglia or spinner. Optimum time: Salmon loves low light condition. So, it is better to catch the fish at dawn or dusk. If the river is low and clear then you can go for dawn fishing that will be effective for you. You can catch on bright sunny days, and then you have to go deeper side. Drift fish: One of the best methods is drift fishing. And this is most widely used by the angler fishers. Usually, cast your bait in upstream, and let it drift down over a pool where salmon fishes are available. Tides: Salmon are abundant at a river mouth. Salmon fishes are caught when high tiding started and beginning of outgoing tide. Troll: Trolling with the boat is a kind of catching salmon fishing. Where a boat is moving up and downstream instead of anchoring in one spot. It is beneficial when salmon is moving with the tide. River rod: This rod is 7-8 ft. It is powerful and essential for slow runs fishing guts and pools. Surf rod: Surf fishing is very interesting. For fishing in the surf, there is surf rod that is 12-15 ft.
Up-river rod: When the river is low and clear then this 5-7 kg up-river rod is the best option. Fly rod: For Clear-water condition fishing 9-weight fly rod is required. Standard inline that helps to revolve spinner in a straight wire. Spinnerbaits that is look alike a safety pin. Buzzbaits that helps in raising bait to the surface easily. Live bait like minnows or night crawlers is used as a lure to catch salmon. 2) Hold the catch with bobbers: These lures are for fishing in the riverbank. The lure is shiny and glowing. You will get a good catch with this lure. 3) Flat fish or Kiwi fish lures: Using fish meat for lure is the most effective lure for salmon. 4) Plug cut herring: This bait is like to use the lure of cutting the head and set the hook in it. As the salmon fish has thick and strong jaw so, you have to sharp the hook so it gets sharper to catch the big fish.Keep the sharp hook parallel to the shank. It is better to fish in the clouds. Because salmon fish don’t like a light. They come out from their hideout when it is dusk or dawn. Try using live bait to get the best catch. The best bait is a fish egg. 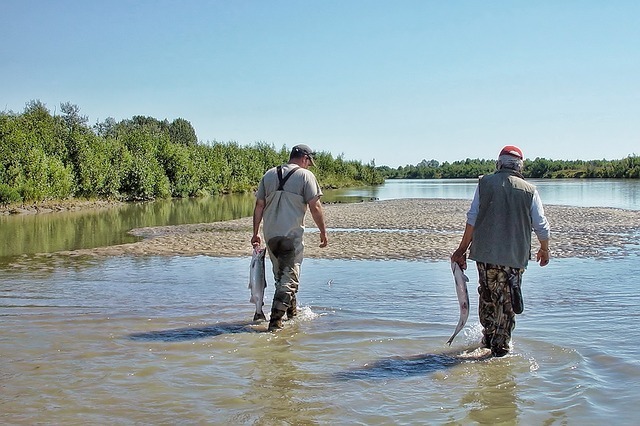 Select the perfect location to go for catching salmon. You have to do research on it. Because if you choose the wrong location then your time will be a great waste. And do check the weather before going for fishing. Now let’s talk about the catching process of the salmon fish. To catch this fish is not easy because it is smart and strong fish. You have to apply techniques to catch this fish. Very first thing is to do must is to catch the salmon fish in perfect time and in a perfect environment. Go for fishing in dawn time when it is time for a spawn. When you are on the water, troll and make it slow. Because there are many hungry predators in the water who wants the lure badly. So we have to careful. When it is time for spawn, the fish grows hungry. They act like crazy for food. So to attract the lure to this hungry fish you have to troll slowly. By this, the fish will see the lure and come fast to take it. Oh, and one thing sometimes the salmon fish stays very low in the water. So try to keep the lure low enough. Salmon fish loves the color. So pick a colorful bait to catch salmon fish. If you are fishing in shallower or in a creek than using a spoon as a lure. It works. As for the line, use 30 lb line. Because when the fish is in the line, it will give a tough fight to free itself. For this, the line has to be strong to endure the fight. After picking the perfect line, go for a hard hook. This fish has a very strong jaw. So it is quite normal to have a runaway fish if you don’t set a proper hook. When the fish is on your line, let the fish fight and grow tired. It will help you to catch the fish easily. To catch salmon fish is not easy but not impossible. You may fail the first time. Try 2-3 times. Then you will be an expert salmon fisher. As salmon fish loves to stay in dark place, you will sometimes find them on shore. To fish from the shore you will have to apply some techniques. Drift fishing is the most effective technique to catch fish from the shore. For this, you will need 12 to the 36-inch line to fish. This line is tied in instant swivel. The bait has to be natural to catch salmon fish. The best ones are herring, smelt, and alewives. These baits are very helpful in catching fish. These baits are set in a live small fish by placing it on the cut head. You have to attach the bit to two hooks. If the live bait is hard to find then you can go for an artificial lure. Try to use shiny and colorful bait. Attach the hook and rotate in the water. Early summer is the time when the spawns start. Before going for migrating, the fish gets hungry. So it is a perfect time to catch salmon. Salmon are great fishes. So, when playing or touching with salmon be careful to handle it. Because light hooked may be broken or troubled by the heavy salmon fishes. You have to keep all the types of necessary tools while you are on fishing. At the starting period of catching season, salmon loves clear water and it is very easy to find the fishes. The most active bait of salmon is Tuna. So, don’t forget to go fishing with live baits. If you are lucky, then your catching of salmon fish would be effective and addictive. Now, why to take so hassle to catch salmon fish. This fish is best tasty food you can take. It is also good for your health. If you are ill and some disease, salmon fish will help you to get healthy. In a salmon fish, you will get vitamin B12, vitamin B6, niacin, zinc, and iron. If you have a thyroid problem, then keep salmon fish in your die chart. This fish has selenium, this mineral helps your thyroid to keep working perfectly and boosts your immune system. You will find this mineral also working as an antioxidant. This fish also contains protein, sodium, phosphorus and omega 3 fats. All of these minerals are great for your health. • Believe it or not, salmon fish has arsenic, dioxins, and DDT in the fish meat. So you have to be careful while eating salmon fish. • Don’t eat farm fish. Because on the farm there are millions of fish growing together. There some wanted disease or element goes into fish. So it is not safe. • Salmon fish tends to get sea lice. This louse harms fish health very much. So try to test before eating salmon fish. Catching a salmon fish is not for only to have the taste. You can catch it for your recreation. You can play the game that catches the fish and let it go. For this, you have to be easy on the fish so that it stays less hurt while it gets hurt when it is caught. How to catch salmon fish is clearly has told in this wonderful article. If you are new to salmon fishing than read this article again and again. Then go for fishing but try to take someone experienced with you. This will help you to make your fishing a success. As salmon fish is a large and heavy fish, you will have to use strong equipment to catch salmon properly. Also, you have to learn about the habit, food habit and migratory time. This will help you to get a decision to catch salmon fish in proper time in a proper way. Fishing is such outdoor activity where you can spend time alone or with your near ones. This is the one thing that you will not feel bored. To catch fish is full of excitement and work too. Because when you want to catch a salmon fish, you have to apply some techniques to catch this big fish. When you have this fish in your line than the fight begins. You have to control your line while the fish becomes tired and give up. Now it is up to you to keep the fish for a tasty steak or let it go to play more catching game. If you are new in fishing line than you may fail, just try to focus and apply some tips then you will be successful. Trust me you will enjoy fishing and keep doing it for a long time.